Shorty Heated: Girl Gets Checked In The Bathroom For Having Her Cleavage Hanging Out! 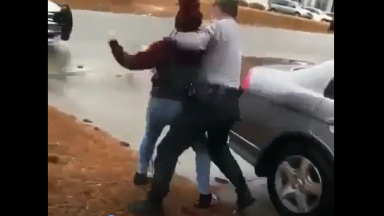 Damn: Cop Puts Girl In A Chokehold And Takes Her Down! Shorty Is Thick Asf From Behind, But Wait Till She Turns Around! She Got The Wrong One: Big Girl Talking Shxt Gets Her Azz Beat In The Hood!